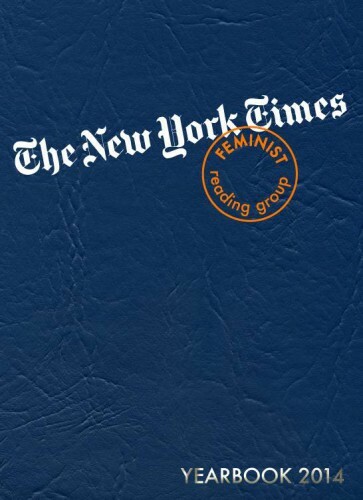 The New York Times Feminist Reading Group Yearbook is a selection of newspaper clippings, annotations, and other ephemera collected from the six public performances of The New York Times Feminist Reading Group that took place in 2014. 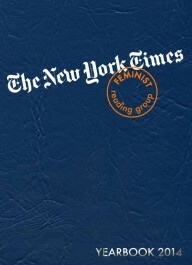 The New York Times Feminist Reading Group is exactly what it sounds like: a public discussion about the content, design, format, editorial decisions, economics, and other aspects of that day?s issue of The New York Times that takes place in museums and galleries throughout New York, and occasionally elsewhere. Yearbook is a concrete, permanent record of an otherwise temporary performance. It is also a diverse portrait of the year; its events, the media landscape in which they happened, and the varied feminist positions and politics embodied by the Reading Group?s many participants. Jen Kennedy is a Canadian writer and artist whose work is invested in constructions of gender and sexuality in art, popular culture, and especially in points of exchange between the two. She received her MA from The University of Western Ontario and her PhD at Binghamton University. She was a critical studies fellow at the Whitney Independent Study Program in 2008-2009. Kennedy?s writing has been published in Grey Room, C Magazine, Fuse, The Journal of Critical Studies in Business and Society, and Esse, among other journals, magazines, and exhibition catalogs. Liz Linden is a Brooklyn-based artist. She received her B.A. in Literature from Yale University in 2002 and she graduated from the Whitney Independent Study Program's Studio Program in 2009. Her work has been exhibited in various public and private institutions in New York and internationally, and is included in public collections including those of the Hammer Museum in Los Angeles and the Art Gallery of York University in Toronto. Kennedy and Linden have collaborated since 2008 on an interdisciplinary project that looks at the semantics of contemporary feminisms. Their work has been exhibited and performed at the Brooklyn Museum?s Sackler Center for Feminist Art, The Whitney Museum of American Art, the New Museum, Performa 2009, and a number of other venues in New York and elsewhere.